Amma returned to Amritapuri on Sunday, July 30th, 2006, after the recent Japan-North America yatra. She arrived at about 10:45 a.m., bringing smiles, laughter and tears of joy to the faces of Her children who had gathered to welcome Amma. Amma, beaming with loving compassion, looked left, right, in front, behind and even above, for there were people crammed on the balcony above and lining the spiral staircase near Amma’s room too. After spending some time chatting with Her children and cracking jokes, Amma walked back to Her room. Amritapuri had come alive again! Amma’s darshan in Amritapuri will start from 5th Saturday August 2006 onwards. Dr. Ruby Dhalla, Member of Parliament for the riding of Brampton-Springdale, welcomed Amma to Canada for the second time. Dr. Dhalla, who is the youngest women to have ever been elected to the Canadian Parliament, began by saying that she was honoured to be in the presence of Amma, not only as an MP and on behalf of the Government, but as also as an individual. “To be able to come in the presence of Amma and to be blessed by her, I think is truly one of life’s most memorable moments,” Dr. Dhalla said before the packed hall in Richmond Hill, Ontario, just outside of Toronto. After garlanding Amma and presenting her with a memento from the Canadian Government, Dr. Dhalla talked about her experience when she first welcomed Amma to Canada in 2004. Dr. Dhalla continued, “I think Amma has been the source of inspiration and the source of hope to not only Canadians here in Canada, but so many people throughout the world. “And just recently I visited India, and I can tell you I was quite taken aback by the number of billboards that display Amma’s pictures, by the number of schools and the number of organizations that speak so highly of the great work that Amma and all the people that are devoted to her and follow her throughout the world [are doing]. “And I can definitely tell you that she is making our world a better place, by touching people and giving them the hope, the inspiration and the empowerment. Amma was welcomed to her programs in Marlborough, Massachusetts by Venerable Dhyani Ywahoo, holder of the Ywahoo lineage and chief of the Green Mountain Ani Yunwiwa. Trained by her grand parents, she is the 27th generation to carry the ancestral wisdom of the Ywahoo lineage. “Mother Wisdom is a seed in each and every one of us, and we see this played so wondrously through the activities of the Holy Mother’s emanation here,” Dhyani Ywahoo said to the packed hall in Marlborough. “In these times there is much suffering that arises from sectarianism. And it is good that we can each trace the Seeds of Wisdom that are inherent in all to that Great Tree of Peace. Holy Mother, Holy Father, essence of each and every one, and from beginningless time it is the natural state of our minds—luminosity. 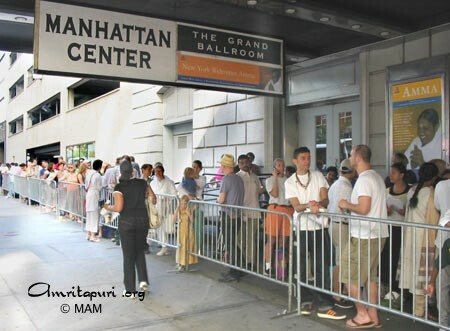 Amma visited NY from 14-16 July 2006. 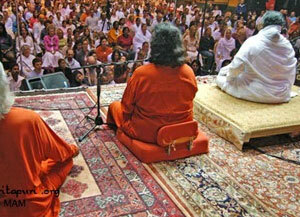 During each of Amma’s programs, Amma has those gathered pray for the peace and happiness of everyone in the world. And in almost all of Amma’s talks, she recalls the seemingly endless list of tragedies—both natural and man-made—that the world is facing. Yesterday added yet another: the eight railway station bomb blasts that claimed at least 190 lives and wounded hundreds of others in Mumbai. The tragedy cast its pale across Amma’s evening program, causing the two ambassadors attending the program to comment on how only Amma’s message of love can overcome such senseless acts of hatred. Ambassador Vijay Nambiar—the Under Secretary General to Kofi Anan, the Secretary General of the United Nations—was the first to garland Amma and welcome her to the Washington D.C. area. Ambassador Nambiar also serves as the Deputy National Security Advisor to the Government of India and as the Head of the National Security Council Secretariat. “It is of course a great blessing and privilege to be here at this session,” he said, “but we speak in the shadow of a great tragedy, a sadness, a kind of bizarre epiphany of hatred and violence, which has taken place in Mumbai just a few hours ago, which has caused a lot of death and destruction. What is it that one should reflect upon on this kind of an occasion, against and opposed to the kind of message of hatred that these acts seek to project? I can only think of the message of love which Amma typifies and embodies—the spontaneity, the undiscriminating, unconditional compassion and love that she extends to everybody. I suppose we need to reflect on this to be able to project it, to be able to reflect it to the rest of our fellow human beings. 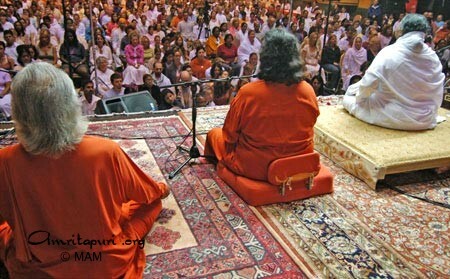 Guru Poornima happened this year to be in Iowa during Amma her annual USA tour in 2006. Amma was giving prasad after the Guru Poornima celebration.